The Student Guide to Social Media is now fully reusable! This actually happened at the end of last year but I didn't get around to blogging about it at the time. It's about the Student Guide to Social media - there's background info below and in a previous blogpost written when it first arrived. It was always Creative Commons so anyone can use it, but now we've taken the ND (Non-Derivative) part off, so it's just CC-BY-NC. In other words you can take it and do whatever you want with it, including repurposing it, remixing it, taking only certain bits of it and not others, and generally reusing it in a flexible way. It was made in Articulate, and the Articulate source file is available via JORUM. So if you want to use it to make something new, please go for it. Whenever we talk about or use this in York the students are really responsive - it often gets rated as 'the most useful aspect' of infolit sessions. There's a growing awareness among undergraduates that social media can play a professional and academic role in their lives, but they often don't know where to start - so this overview is something they find helpful. 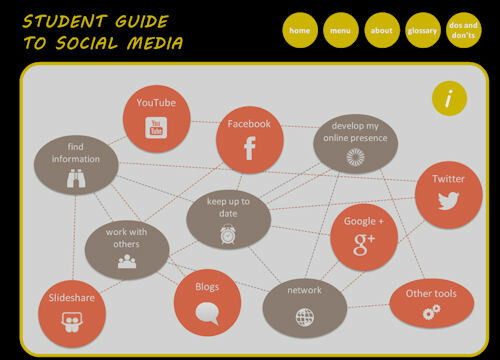 There's a bit more info about the Student Guide to Social Media on JISC's Digitial Student pages, too.